There were 85m fewer bus journeys made in England during the year ending March 2018 than in the previous year, the latest Department for Transport (DfT) annual bus statistics have revealed. This represents a fall of 1.9%, bringing the total number of passenger journeys in England to 4.36bn. Taking London out of the equation, the number of passenger journeys in England declined by 3.2% over the same period. Now standing at 2.13bn journeys, this figure is down 4.2% on the number of journeys completed in the year ending March 2005. Conversely, in the capital, bus use also fell last year (although only by 0.7%), but this figure is still 23.5% higher than it was in the year ending March 2005. When it comes to the divide between metropolitan and non-metropolitan areas (once again excluding London), passenger journeys fell more sharply in the six former metropolitan counties (3.3%) than elsewhere (3.1%). However, the vehicle mileage statistics tell a different story: in metropolitan areas, this figure stands at 0.3bn miles (a fall of 2.6% on the previous year), while in non-metropolitan areas mileage fell by 5.1% (now standing at 0.59bn miles). Only 18 of the 88 local authorities in England (outside London) experienced an increase in bus use per head. Fare prices increased 2.8%, ahead of the 2.5% rate of inflation over the same period (measured by the Consumer Prices Index). Martin Dean, Managing Director – Bus Development at Go-Ahead Group, commented: “Whilst the national picture is challenging, Go-Ahead is achieving growth in some cities through partnership working with local authorities to prioritise bus travel. 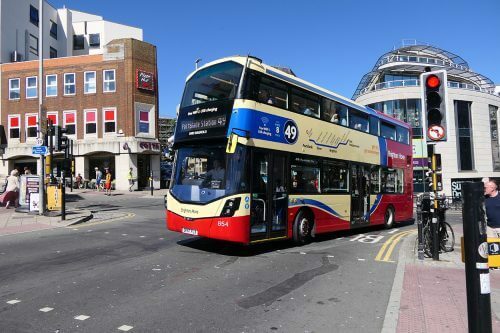 Since 2011, bus usage has risen by 8.3% in Brighton, 18.8% in Bournemouth/Poole and 25.8% in Southampton. “We must put bus at the heart of planning for schools, hospitals, housing, town centres and social services.